This is in response to your inquiry of April 13, concerning the Occupational Safety and Health Administration's (OSHA) hazardous Waste Operations and Emergency Response final rule (29 CFR 1910.120) (HAZWOPER) and the Hazard Communication Standard (29 CFR 1910.1200) (HCS). Please accept my apology for the delay in this reply. Thank you for your interest in these regulations and for your dedication to insuring a safe and healthful work place for you and your colleagues. Are hazardous materials generators who are using, packaging and transporting hazardous materials to 90 day storage areas required to have training as specified in 29 CFR 1910.120 or 1910.1200? Voluntary clean-up operations at sites recognized by Federal, state, or local governmental bodies as uncontrolled hazardous waste sites. Emergency response operations for releases of, or substantial threats of release of, hazardous substances, without regard to the location of the hazard. The applicable training requirements under 1910.120 depend on which above listed operations are involved. From your letter it appears that your workplace may potentially fall into either category (4) or (5) For operations in (4) and (5) above the requirements are specified in 1910.120 paragraphs (p) and (q) respectively. There are exceptions to paragraphs (p)(1) through (p)(7) which are discussed in attachment A to this letter. It appears from your letter that hazardous waste is stored at your facility for less than 90 days. Therefore, your facility may not be required to have a RCRA permit. If that is the case, paragraphs (p)(1) through (p)(7) of 1910.120 would not be required of your employers. Paragraph (p)(8) and/or (q) of 1910.120 would apply to your workplace if the employees are at substantial threat of releases of the hazardous substances you listed in your letter and provide emergency response. Paragraph (p)(8) applies in areas used for treatment, storage or disposal of hazardous waste. In other areas not used primarily for treatment, storage or disposal of hazardous waste, any employers with employees involved in emergency response operations must comply with (q). The employer may choose to comply with (q) throughout the facility which would satisfy the requirements of paragraph (p)(8). There are also exceptions to some of paragraph (q) requirements that are discussed in attachment B to this letter. Paragraph (q) of 1910.120 requires different levels of training depending on the employees assigned role during an emergency response. The required training and competencies for each level of emergency response are described in detail in paragraph (q)(6) of the final rule, which is enclosed. Protect your workers from dangerous fumes with supplied air respirator systems like this one from Safety Emporium. The Hazard Communication Standard (HCS) also requires training for employees exposed or potentially exposed to hazardous chemicals. The Hazard Communication Standard does not, however, cover hazardous wastes as defined and regulated by the EPA. For other hazardous chemicals known to be present at the workplace, the standard states that health hazard information is required to be transmitted from the chemical manufacturer or importer and flow "downstream" with the substance as it is used by industry. For your further information, I am enclosing the OSHA booklet "Chemical Hazard Communication" which will provide you with information on the requirements of the HCS, including required workplace training. In general, "hazardous materials generators who are using, packaging and transporting hazardous materials" may be required to train their employees by 1910.1200 and by 1910.120, depending on the chemicals they work with and the actions they are required to take during an emergency. The content and objective of the required training from the two standards are different. Please explain the difference between 29 CFR 1910.120 and 1910.1200 as it applies to the individual employee. The required Hazard Communication covers all employees who work near chemicals. It requires the employer to train workers about work place specific safety and health hazards, how the employee can access information pertaining to those hazards and how the employee can use the information effectively to protect his or her health. The Hazard Communication Standard has limited training requirements with regard to emergency procedures. The employer must provide employees with training on recognizing hazardous incidents and how to evacuate during an emergency. In contrast, HAZWOPER only covers employees at hazardous waste sites, Treatment, Storage and Disposal Facilities and those employees that will respond during to emergencies involving the spill of hazardous material. For emergency responders there are five different levels of training for five different levels of responsibility during an emergency response. These levels and training requirements for each can be found in paragraph (q)(6) of the final rule which is enclosed. Please specify all training required by the Code of Federal Regulations that pertain to your area of concern. Besides 1910.120 and 1910.1200 training requirements, there are specific training requirements for those employees required to wear personal protective equipment (PPE). The training required depends on the equipment to be used by the employee. Please refer to 29 CFR 1910.134 (Correction 07/27/00) [29 CFR 1910 Subpart I] for a more in depth discussion of required training for those using PPE. 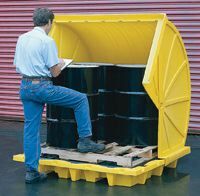 Please advise of any training required for supervisors in charge of employees who use, package and transport hazardous materials to 90 day hazardous storage areas. Under 1910.1200 there are no specific requirements for training supervisors per se. Any employee exposed or potentially exposed to hazardous chemicals must be trained on those hazards regardless of his job title. The level of training required by 1910.120 paragraph (q) is dependent on the role the employee will play when involved in a response to an emergency incident as discussed above. The Budget Reconciliation Act passed by the 101st Congress stipulated a seven-fold increase in the maximum limits for OSHA civil monetary penalties. The maximum allowable penalty is now $70,000 for each willful or repeated violation. For further information regarding the new OSHA civil penalties policy I have enclosed fact sheet NO. OSHA 91-36 [Please see Fact Sheet No. OSHA 92-36]. I hope this information is helpful. If you have any further questions please feel free to contact MaryAnn Garrahan at [(202) 693-2190]. Exceptions to the hazardous Waste Operations and Emergency Response Final Rule (1910.120), as amended April 13, 1990. All provisions of pparagraph (p) of this section cover any treatment, storage of disposal (TSD) facility regulated by 40 CFR parts 264 and 265 or by state law authorized under RCRA and required to have a permit or interim status from EPA pursuant to 40 CFR 270.1 or from a state agency pursuant to RCRA. Employers who are not required to have a permit or interim status because they are conditionally exempt small quantity generators under 40 CFR 261.5 or are generators who qualify under 40 CFR 262.34 for exemptions from regulation under 40 CFR parts 264, 265, and 270 ("excepted employers") are not covered by paragraphs (p)(1) through (p)(7) of this section. Excepted employers who are required by the EPA or state agency to have their employees engage in emergency response or who direct their employees to engage in emergency response are covered by paragraph (p)(8) of this section and cannot be exempted by (p)(8)(i) of this section. Excepted employers who are not required to have employees engage in emergency response, who direct their employees to evacuate in the case of such emergencies and who meet the requirements of paragraph (p)(8)(i) of this section are exempt from the balance of paragraph (p)(8) of this section". If an area is used primarily for treatment storage and disposal any emergency response operations in that area shall comply with paragraph (p)(8) of this section. In other areas not primarily used for treatment storage or disposal any emergency response operations shall comply with paragraph (q) of this section. Compliance with the requirements of paragraph (q) of this section shall be deemed to be in compliance with the requirements of paragraph (p)(8) of this section. a generator is a conditionally exempt small quantity generator in a calendar month if he generates no more than 100 kg of hazardous waste in that month. Except for those wastes identified in paragraphs (e), (f), (g) and (j) of this section a conditionally exempt small quantity generator's wastes are not subject to regulation under parts 262 through 266, 268 and parts 270 and 124 of this chapter and the notification requirements of section 3010 of RCRA, provided the generator complies with the requirements of paragraphs (f), (g) and (j) of this section. The provisions include storing wastes in RCRA approved tanks and containers, which must be labeled with the start date of accumulation, and have a sign identifying the container as containing "Hazardous Waste". For more information in the specific provisions entailed in (a) above, or for general information concerning the Resource Conservation and Recovery Act (RCRA) call theRCRAHotline at 1-800-424-9346 from 8:30 am to 7:30 pm eastern standard time. Mark the location of your emergency and safety equipment with signs from Safety Emporium. Exceptions from paragraph (q) of the Hazardous Waste Operations and Emergency Response Final Rule (1910.120), as amended April 13, 1990. There are two areas relating to exceptions from the requirements of 1910.120 paragraph (q). Incidental spills in manufacturing locations that could be cleaned-up or stabilized by employees working in the immediate spill area without need of a coordinated spill control response are not considered emergency incidents under 29 CFR 1910.120 and therefore do not require employees to be trained. Such employees would have training requirements under the Hazard Communication Standard (1910.1200) and other appropriate training made necessary by the tasks they are expected to perform. "... Employers who will evacuate their employees from the danger area when an emergency occurs, and who do not permit any of their employees to assist in handling the emergency, are exempt from the requirements of this paragraph if they provide an emergency action plan complying with section 1910.38(a) of this part." The exceptions from paragraph (q) are allowable. However there is a certain level of knowledge, which could be interpreted as at least awareness level training, required to distinguish between incidental spills that can be handled in house and spills that require evacuation and the assistance of a Hazmat team. OSHA would prefer to see all potentially exposed employees trained to at least the awareness level, regardless, of the employers intention to evacuate in the event of an emergency release incident. OSHA Directives pertaining to the Hazard Communication Standard - OSHA Instruction CPL 2-2.38A - May 16, 1986 (Amended by CPL2-2.38A CH-1, July 18, 1986) - Pages 53 and 57. Mortality among a Cohort of US Man-Made Mineral Fiber Workers: 1985 Follow-up (Gary M. Marsh, PhD; Philip E. Enterline, PhD; Roslyn A. Stone, PhD; and Vivian L. Henderson, MS(Hyg)) Pages 594-603. My name is Fred Williams and I am employed by Martin Marietta Energy Systems Inc of Piketon Ohio. I work in the Instrument Dept Metrology Lab and use certain Chemicals, which I have a partial listing of these Chemicals on the preceding page. In the everyday use of these Chemicals we generate waste, which we treat as hazardous Waste and are required to transport this waste to a 90 day hazardous Waste storage area. To date there is a difference of opinion, between Myself and the Company, as to the training required for a hazardous Waste Generator who uses, packages and/or transports this hazardous Waste. I have listed five questions on the preceding page, for which I feel, will help to remove the difference of opinion once and for all on both sides. I would appreciate your reply to each question I have listed and any other information you may feel will help. I am the Union Steward for the Instrument Dept and have tried to work with the Company in securing the answers to these questions from your office and to date I have only received road blocks. It seems we are the only ones who are concerned about the answers to these questions. I have recently spoke with Wendel Glasier, OSHA, and our conversation prompted me to secure the proper interpretation of these questions from you. I feel that you, as the Subject Matter Experts, will be able to remove any concern the Company or Myself may have in the interpretation of the stated laws. Thank you for all your time and concern. Are hazardous Materials Generators who are USING, PACKAGING, AND TRANSPORTING hazardous Materials to 90 day hazardous storage areas required to have training as specified in 29 CFR 1910.120 or 1910.1200? Please explain the difference between 29CFR 1910.120 and 1910.1200 as it applys to the individual employee. Please specify all training required by the Code Of Federal Regulations that pertains to your area of concern. Listed below is a partial list of chemicals that we work with!! !